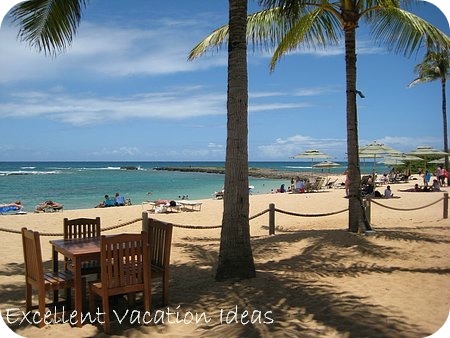 Apple Vacations All Inclusive holidays are a great vacation idea for your next romantic or family vacation. Apple Vacations is an excellent and popular tour company to book with once you have chosen where you want to go and that you want to take an all inclusive vacation. 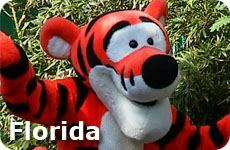 They have been in business for over 36 years and have provided amazing vacations to millions of happy travellers! All inclusive holidays are an affordable and convenient way to book your vacation. Their packages leave from many US cities and go to most of the popular destinations that you are looking for. If you are departing from a smaller area, then Apple will still look for a flight for you, and route you through a major airport. 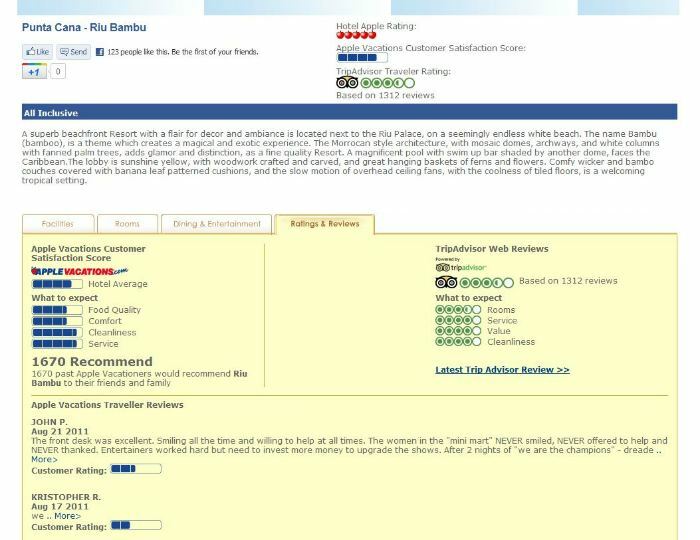 Apple Vacations were voted the Best Tour Operator to Mexico by the readers of Travel Weekly and Recommend Magazine, and I have to say that they offer all of the typical hotels or resorts and their prices looked pretty good! Their website is set up quite easily to use. You can find out all the information about the destination that you are interested in, and what Apple and TripAdvisor rates a particular resort you are looking for. You can do a search by location or hotel and or you can type in where you are leaving from, where you want to go, the dates you are considering, and how many people are travelling with you and get a list of what is available in seconds. 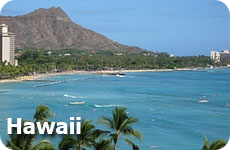 Including the flights they recommend and hotels or resorts that are available. Their website and search engine is so easy to use. You can choose a destination and find hotels and resorts to browse through. So for example, you can enter in the dates you want to travel, where you would like to leave from and go to, and how many adults and children will be travelling. You can also choose to look only for hotels, or flights, but since we are looking for all inclusive Apple Vacations, we will leave those buttons unchecked. If you are unsure of where you want to do, but know your departure city, click on the "specials" button and enter in your departure city. It will bring up specials that are available in the next 2 months or so. It is a good place to start. However for this example, we know we want to go to the Dominican Republic - Punta Cana. 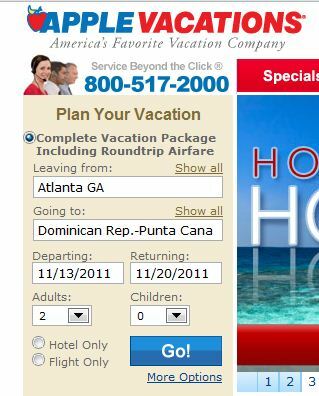 As you can see you they will have selected a flight for you from Atlanta (in this case) for your Punta Cana Vacations with not bad flight times actually. You have the option of changing flights if you want, just click on the "Change Flight" button. 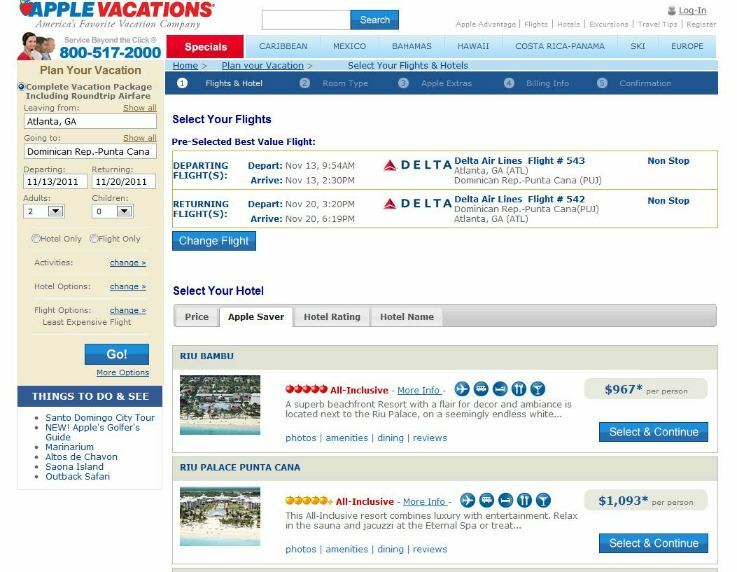 It will bring up options of other airlines and flight times with more than likely an extra cost per ticket. Below that you will see four tabs, with it on the "Apple Saver" tab. 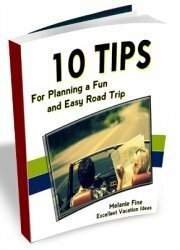 This lists all the resorts by recommended by Apple Vacations and with the lowest price of those recommended resorts. If you are only interested in Price and don't care where you stay, then click on the "Price" tab and it will show you the lowest prices first. 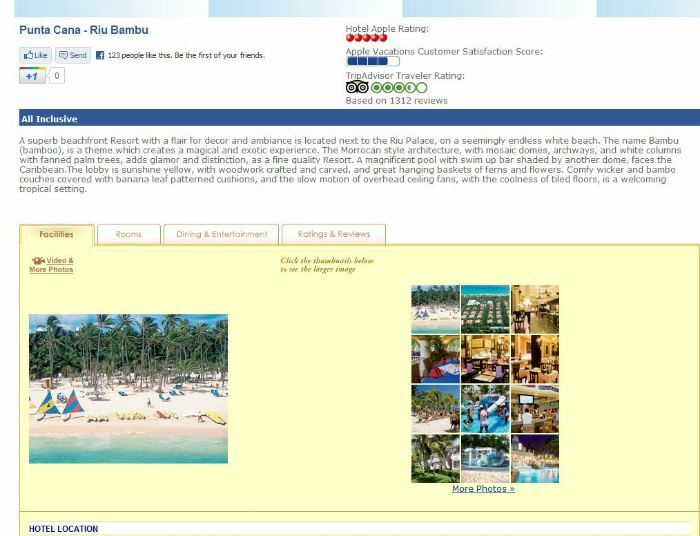 As you are looking for Apple Vacations all inclusive holidays, look for the resorts that offer "All-Inclusive" as you can see above. You will also see a legend of what is included in the package at this resort . The first one includes your flights, transfers to hotel, accommodations, meals and drinks. Have you taken an Apple Vacations holiday? Please comment below and tell us how it went for you! 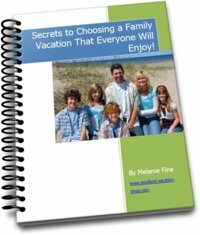 Check out our ideas for some cheap all inclusive ideas and other family vacation ideas. 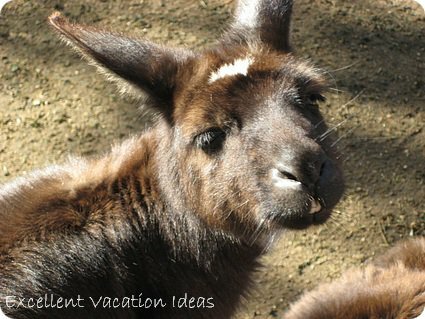 All sorts of fun ideas for vacations for kids down under. Visit a Koala, try surfing, go on a walk about in the Outback. Whatever you choose Australia has something for everyone.